The pilot communications app that extends the features of your Lightspeed headset. We developed FlightLink, our free aviation app for iPad and iPhone, to take your Lightspeed headset to the next level. FlightLink works seamlessly to capture and retrieve incoming and outgoing communications in the cockpit. Record all activity over the intercom, including inbound and outbound transmissions and in-cabin conversation. 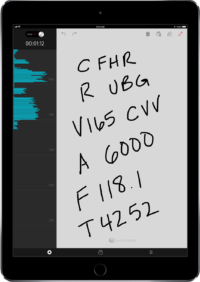 Draw notes, codes, or diagrams with your finger on the iPad scratchpad. Playback instantaneously. Choose to listen to the prior two seconds or two minutes. 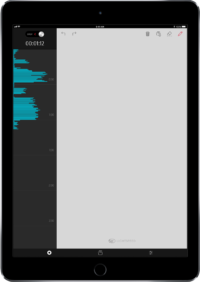 Store your recording library in your iPhone, iPad, or iTunes account. Custom user profile – Configure and save key audio and operational settings to your profile. Clear audio – Fine-tune audio response for maximum clarity. Settings can even be customized to help improve audio for those with hearing loss. Crisp vocals – Our Voice Clarity option boosts frequencies common in human speech without impacting the quality of music from auxiliary devices. Easy updates – Download software updates as PFX evolves with new innovations. What a genius idea! This is awesome. A great way to record yourself and ATC! Great Cross Country App! I’ve really enjoyed using FlightLink over the past few cross-countries. Allows me to hear what I need to fix with my ATC communications, and what my instructor said. I highly recommend! Air Traffic Controllers are notorious for blasting out rapid fire instructions to pilots. Being able to record and instantly playback the radio transmissions is a godsend. The scratchpad is a big bonus in this app. Highly recommended! Works great! Thanks for the app. Great Cross Country App! I’ve really enjoyed using flightlink over the past few cross-countries. Allows me to hear what I need to fix with my ATC communications, and what my instructor said. Scratchpad is also a must! Great app to use if your going on a cross country. I highly recommend!!!! 5 stars – Air Traffic Controllers are notorious for blasting out rapid fire instructions to pilots. Being able to record and instantly playback the radio transmissions is a godsend. The scratchpad is a big bonus in this app. Highly recommended! I also highly recommend their Zulu noise canceling headsets which work beautifully with this app. Requires: Requires iOS 11.0 or later. Compatible with iPhone, iPad, and iPod touch.